As webmaster for the 'derbysulzers' site the website email inbox receives messages from across the United Kingdom and globally with reference to matters related to the Class 24/25/26/27/33s and the Sulzer powered locomotives delivered to many overseas locations. Usually these are of a historical nature, with notes and images often provided to fill in gaps in the website. Other questions are frequently asked by railway modellers with reference to specific locomotives regarding liveries or modifications etc. 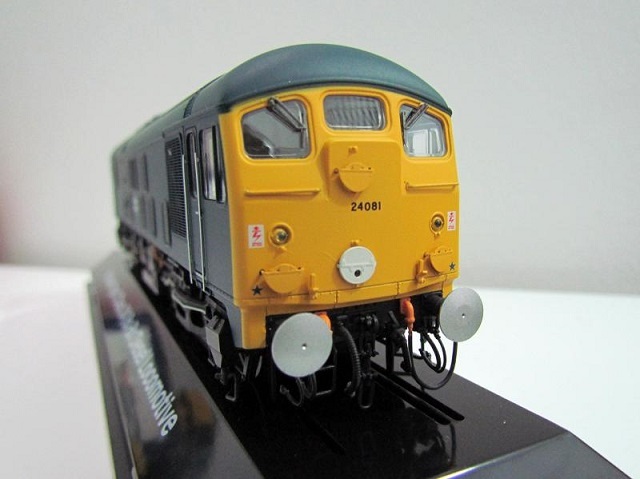 Included in this category during 2015 were several emails referencing the upcoming production of a new OO Class 24, with the pre-production publicity material indicating that this would be a model unlike any existing commercially produced model available to date in the United Kingdom. As usual the information was tucked away for a later date, though with all that was going on in the last quarter of 2015 (my retirement & travel plans to Canada), a considerable amount of website material was also 'put into a siding' until things calmed down. Retirement brought a monetary gift from my employer, enough to cover airfare for two to the United Kingdom and a car rental as well! The trip had to be taken within six months of my retirement, thus April was chosen for the visit to family and friends in the UK. Thus on the first Monday in April a trip was made to Los Angeles International Airport to connect with a British Airways Airbus A380 for the nine hour forty minute flight to London Heathrow. This was my first ride in one of these double deck machines, we were upstairs in the truly economy class, a little claustrophobic if the person in front of you put their seat back all the way, and it was necessary to be a contortionist to extricate oneself from the seat during the flight. But the flight was smooth, ontime and arrival was greeted by typical English April weather, virtually all seasons in one day. The weather would remain highly variable for all of our stay. Having reached the promised land and managed to discover that the family had not completely filled in my calender, contact was made with Philip Sutton, owner of Sutton's Locomotive Workshop at King's Cliffe, with an invitation being offered to visit the birthplace of the recently released highly detailed Class 24 model. Thus on a wet & windy Friday morning the two hour journey was made from Derby to King's Cliffe, Northamptonshire. The small office was a hive of activity as Philip and team members Jamie & Caron worked a number of tasks, including preparing packaging material and loading files on to sound cards. The office walls were graced with many model locomotives in a huge variety of liveries, very familiar to the English rail enthusiast, but not this expatriate from the colonies. It was quickly down to business as Philip produced examples of the two current production Class 24s; D5000 in green livery and 24081 in blue/yellow livery. A cursory glance at these two models indicated that a great deal of research had gone into preparing the models for production and that the production process itself had maintained the level of detail and accuracy envisaged by Philip. Having spent many hours studying photographs of the Class 24s, it is remarkable that there are so many external detail differences, as they came off the production line and as they underwent changes and improvements during their lifespan. 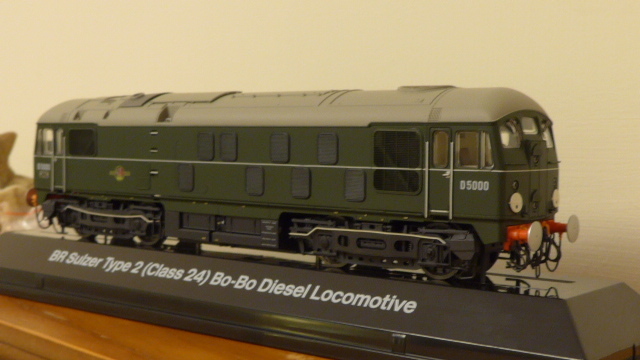 These details have been faithfully & accurately picked up in the models of D5000 & 24081. For D5000 the details include the split-screen radiator grilles found on the first six locomotives, the unique builder's plate, the original exhaust port, the detail around the frame level valancing.......and for 24081 the number in black on the cab front, the space vacated by the boiler water tank, the circular gauge on the fuel tank, the builder's plate positioned on the cab-door and in both cases the incredible detail on the bogies, the buffer beam and the interior cab detail. For the purist the scale dimensions are correct, thus providing an immediate visual sign that the locomotives just look right proportionally, no matter which angle you view them from. Additionally the cab glazing, always a challenge at the best of times has been successfully dealt with on these models - well done! If the accuracy and detail of the two models has set your senses alight, for those that purchase the locomotives with the sound function, then another treat awaits you. The sound is faithfully reproduced from recordings made of a preserved Class 24. They not only record the expected idle and power settings but go through the whole start-up routine, including cab doors closing and firebell tests. The recording of the engine having the power taken off and coming down to idle is simply one of those long remembered memories enjoyed from days gone by. Although there was no opportunity to test the locomotives on a model layout, the short length of track set up by Philip to test the abilities of the sound card, gave a brief indication of the responsiveness of the locomotives to the application of power. Also reviewed were a couple of pre-production Class 24 bodyshells reflecting variants not covered by D5000 or 24081. These again were of the high quality of the two existing production models and the differences they encompassed were truly authentic to the full size locomotives they modelled. 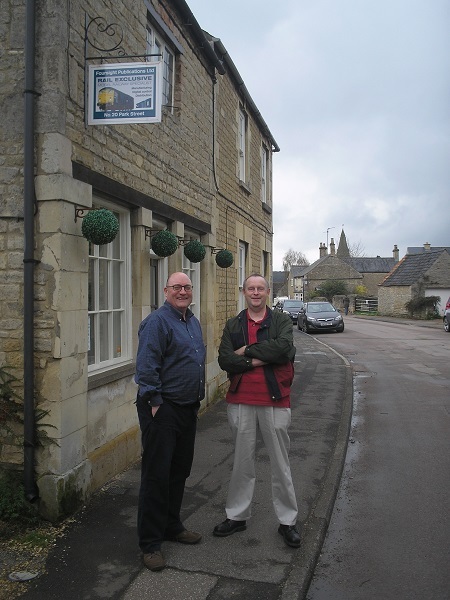 The time passed quickly, including a delightful pub lunch with Philip & Jamie. It had been a very enjoyable look into not only the models locomotives themselves but also the huge amount of energy and resources required to go from a simple idea to a production model. A big thanks to Philip, Jamie & Caron for their awesome hospitality, thank you! Purchasing the model locomotives is best done by ringing +44 (0) 1780 470086. The company website at Sutton's Locomotive Workshop gives all the specifications and prices. The success of the first two models (D5000 & 24081) has allowed a third, Tyne Dock - Consett route No.D5107 to go in to production. Philip and the 'derbysulzers' webmaster at the Sutton's Locomotive Workshop. Whilst checking the map on how to get from Derby to King's Cliffe, little thought was given to any railways that might have been in the vicinity of our destination, but whilst approaching King's Cliffe on a country road connected to the A47, the road passed under a railway bridge. Little thought was given at the time but later some research revealed this was part of the now closed ex L&NWR route from Peterborough through Seaton and Market Harborough to Rugby. The line closed to passengers on June 6th 1966 (fifty years ago at the time of writing this). And then of course the light came on that the last passenger services over this route were handled by Class 24s. 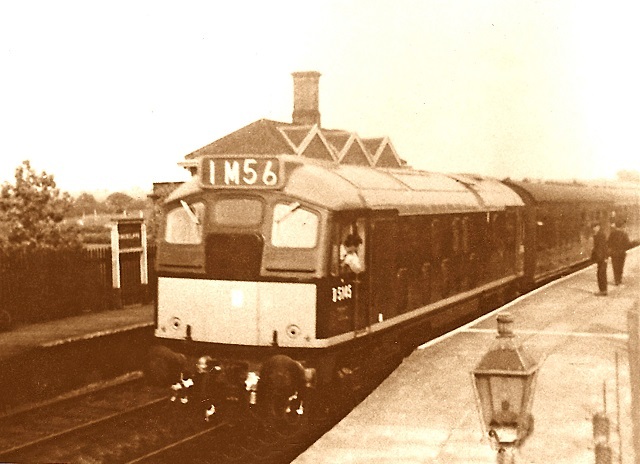 The line was used by a number of long distance services including the Birmingham - Yarmouth, which on the last day had D5085 with ten coaches including a buffet. It was running about twenty minutes late after holding a connection at Rugby for a Perth service. En route it passed, at Welford, D5145 on the 1M56 12.40 Harwich - Rugby (the 16.13 off Peterborough). The Yarmouth service was re-engined at Peterborough with D5526, allowing D5085 to handle the four coach 20.12 final service back to Rugby. This left D5185 working the final 20.20 Leicester service, with Peterborough East closing completely after the 23.15 to March. In light of the link between the former Class 24 hauled passenger service through King's Cliffe and the sign hanging from the front of Sutton's Locomotive Workshop, one wonders if perhaps at some point a model locomotive featuring one of those working the final passenger services through the village might go into production.